How to send log files to the Patch Manager Plus support team? When you face issues while working with Patch Manager Plus, it is mandatory for our experts to refer to your logs to resolve the issues you are facing. To provide an appropriate solution for your issue, you must send us log files along with a description of the issue and screen shots, depending on the issue. You can follow this document and upload the required logs. and the steps involved in sending it to the Patch Manager Plus support. Note: <Install_Dir> refers to the directory where the Patch Manager Plus server is installed. You need to upload Distribution Server logs, if you are facing problems on managing your remote office computers. 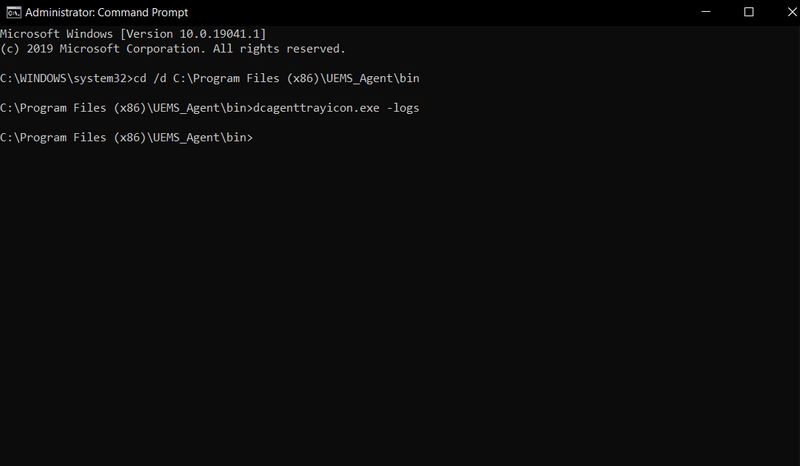 Go to command prompt and navigate to the location, where Patch Manager Plus Agent is installed. You can see that the Patch Manager Plus logs will be extracted and archived in the PatchManagerPlus_Agent folder. You can upload/send this log file to the Patch Manager Plus support team. You can see that the Patch Manager Plus logs will be extracted and archived in the PatchManagerPlus_Agent/ folder. You can see that the Patch Manager Plus logs will be extracted and archived in the Patch_Manager_Plus_Agent/< computer_name >_DCAgent_Logs.zip folder. The file will be saved in .zip format. You can upload/send this log file to the Patch Manager Plus support team. The zipped log files are successfully uploaded.